RE-Flections: Just Another Annual Meeting? 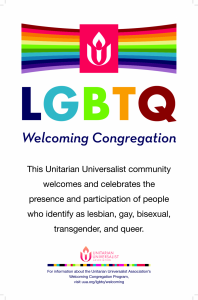 This past Sunday, I attended yet another Annual Meeting of the Unitarian Universalist Fellowship of Midland. Leading up to the meeting, I had many new members ask me what happens at an Annual Meeting. I told them about how we select our Board members, vote for the Budget, and receive reports from our teams and volunteers. We vote on By-Law changes. The Annual Meeting is an important part of running the Fellowship, but it is mostly business. Or is it? On Sunday, I was reminded that our Annual Meetings are anything but “just business.” Sure – some years have been quick and concise. We’ve gone in, heard the reports voted in the budget and officers and gone on our way, but more often, the Annual Meeting is where we gather and FEEL how we are as a community. We celebrate the Unsung heroes amongst us, and we share things we struggle with as a community. Each Annual Meeting has its own tenor and personality. This year, I was reminded that always it is sacred space. The meeting ran long and yet our chair, Sara Clavez, kept us on the task at hand. She never wavered in moving us through the agenda, and yet she made certain each voice was heard. As the voices were heard, a story unfolded. It was a story of a community that values each other for all that we are. Our number one community value is not just the democratic process – though we honored it. It is not that we all agree on everything or that we all have to follow the same identical path – though we agreed on a way to unite together behind a cause. Our number one community value that I saw celebrated on Sunday was and is our sacred commitment to each other. We deeply value and cherish this community and one another.